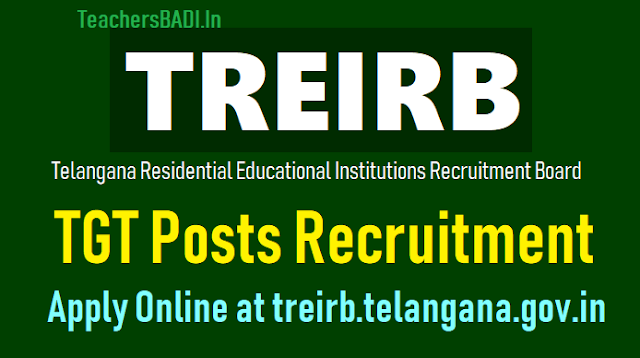 TREIRB TGT Posts 2018 Hall tickets, Exam date (September 3rd week) - TREIRB TGT Posts 2018 Recruitment, Apply online at https://treirb.telangana.gov.in: TREIRB to fill TGT Posts in Residential Educational Institutions Societies through Direct Recruitment 2018. Telangana Residential Recruitment Board has given the TGT Posts 2018 recruitment notification to fill the Trained Graduate Teacher Posts in #TREIS, TSWREIS, TTWREIS, MJP TBCWREIS and TMREIS Residential Instituitions through Direct Recruitment. TREIRB TGT 2018 Hall Tickets Download: TREIRB PGT 2018 Hall Tickets Out at treirb.telangana.gov.in, Download Now. TREIRB PGT 2018 Hall Tickets have been released by the Telangana Residential Educational Institutions Recruitment Board (TREIRB) on its official website - treirb.telangana.gov.in. TREIRB is scheduled to organize the examination for Telangana Post Graduate Teachers (PGT) from 28th September to 8th October 2018 and Trained Graduate Teachers (TGT) from 11th October to 24th October 2018, next month. Paper-I will be common for PGT and TGT teachers and will be held on 6th October 2018 in a single shift from 10am to 12noon. How to download TREIRB TGT 2018 Hall Tickets? TREIRB TGT Posts Recruitment notification released for fill up the below mentioned posts in TS Residential Institutions through Direct Recruitment - Telangana Gurukulam Recruitment Board TGT Posts in TREIS Instituitions. Applications are invited Online from qualified candidates through the proforma application to be made available on Board’s TREI-RB WEBSITE (www.treirb.telangana.gov.in) to the post of Trained Graduate Teachers in Residential Educational Institutions Societies. So, Telangana Residential Educational Institutions Recruitment Board (TREI-RB), Hyderabad invites applications for the post of Trained Graduate Teachers in Residential Educational Institutions Societies. Pass in Bachelor of Education (B.Ed) course with the subject concerned as a methodology subject from any institution recognized by the NCTE. Pass in Paper II of Telangana State Eligibility Test (TSTET) / Andhra Pradesh Teacher Eligibility Test (APTET)/Central Teacher Eligibility Test (CTET) Note: 20% of weightage will be given to TET PaperII score and 80% weightage to the written test conducted by TREI-RB. In case of APTET, scores obtained before the appointed day i.e, 02-06-2014 shall only be considered. ii. Last date for submission of ONLINE applications Dt: 10.08.2018.